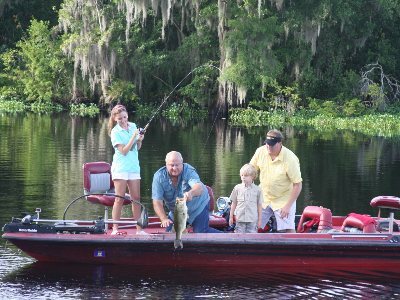 We have seven experienced, U.S. Coast Guard licensed bass guides that fish 12 months a year. They all run fully equipped and comfortable boats. Our fishing guides furnish boats, fuel, tackle and equipment. We provide artificial lures and have live bait available for an extra cost. Guide trip costs includes 1 or 2 people with an additional fee for extra persons. Pontoon boats are available for larger groups and the disabled. Live bait (Wild Shiners) are extra. Wild shiners currently cost $17.00 per dozen. Guides normally carry 4-5 dozen shiners for half day trips and 6-7 dozen shiners for full day trips.